One size hat to fit average adult. 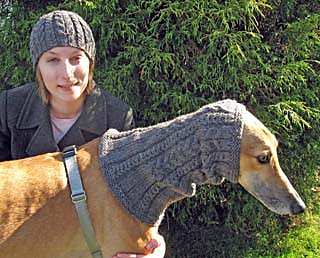 One size snood to fit large dog. You’ll be looking warm and stylish with this hat and matching dog snood when out on your walk. The owner’s hat is sized to fit an average adult - approximately 20” measured around the head. The snood will keep the ears warm of a large dog and measures approximately 14” around the snout, 23” around the base of the neck, and approximately 15” long.